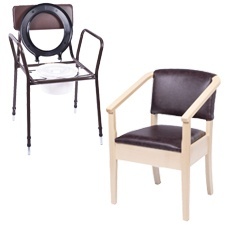 Commode chairs offer a solution to those with limited mobility as they are convenient to use around the home. Various styles are available including folding and wheeled for ease of use. Commode accessories are also available, which make cleaning and emptying commodes easier and more hygienic. These include no spill gels which absorb liquid and commode liners making the disposal of urine quick and simple.